For a while I've had something of a quandry trying to reconcile the work of Bill Willingham on Fables, which I very much enjoy, and the work on Bill Willingham on Robin, which hasn't been my favorite. Add to that Willingham's newest creation, the Shadowpact as seen in Day of Vengeance, which I also enjoyed. So when the Shadowpact goes calling on Robin, it remained to be seen whether one would elevate the other; unfortunately, this is not the case. Robin hasn't really worked for me since Chuck Dixon left -- mainly because the character has never felt quite natural under another writer. 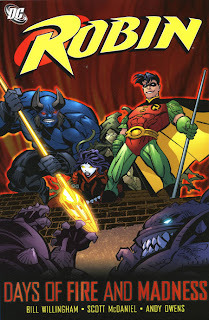 In Robin: Days of Fire and Madness, Willingham places Robin in two ill-fitting situations: one, as part of a military special operations group (where we're supposed to believe Robin might actually consider leaving Batman to work for the government), and then against a horde of supernatural demons. Dixon's Robin worked for me because, for the most part, it was the adventures of Batman's junior partner in Gotham City; pitting Robin against supernatural characters like the Warlock's Daughter takes the gritty-Batman appeal out of it -- battling ghosts, Robin could just as easily be Blue Beetle. Willingham plays Tim Drake as something of an immature kid -- a little dumbstruck in combat, awkward around girls -- and it seems like this ignores his leadership in Teen Titans and the overall length of his time as Robin. The barrage of purposefully silly super-villains at the end doesn't help, as this has even less to do with Robin or the Shadowpact, and serves mostly as OMAC Project filler. Willingham gets points for his portrayal of Superboy and Robin's friendship, but with the advent of One Year Later making most of this trade moot, Robin: Days of Fire and Madness would definitely be one to cut if your budget made it necessary.